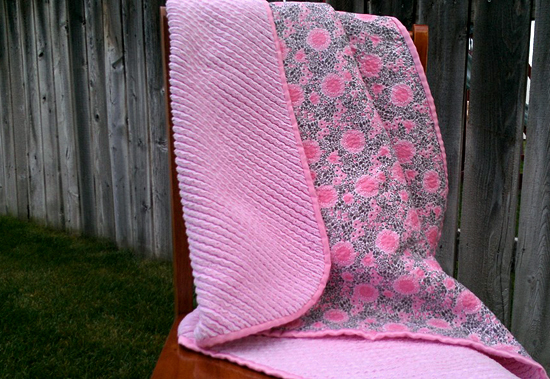 ' Faux Chenille Baby Blanket - Sisters, What! 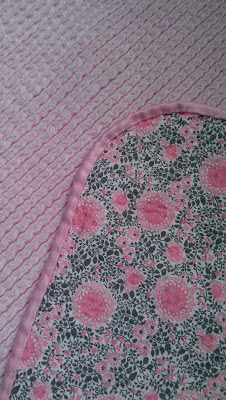 These faux chenille baby blankets are super soft and fun to make. They make great gifts for friends or loved ones or make one for yourself. 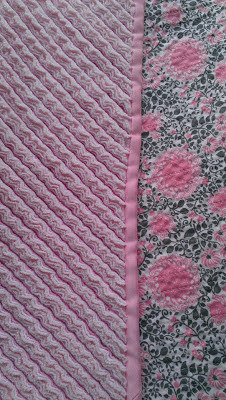 First of all, there are lots of different tutorials already out there for these awesome blankets, when I first made mine I used this great tutorial: http://www.danamadeit.com/2008/07/tutorial-faux-chenille-blanket.html I just thought I would throw my two-cense out there about some of the things I have learned after making several of them. - 1 ¼ yards each of 3 or 4 fabrics for the chenille part (flannel works best for this) if it has a pattern just know that you really won’t be able to see it after it’s all cut up and washed. 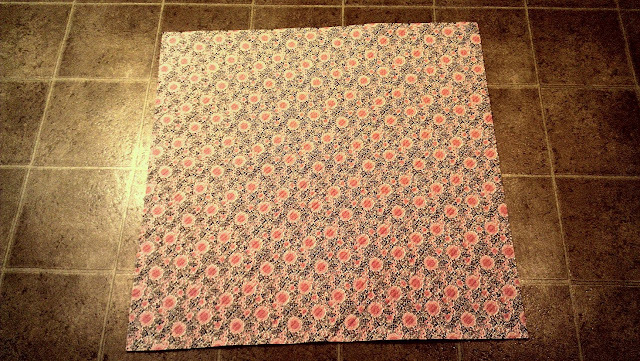 - ¼ yard fabric for binding. This can be any fabric (cotton, flannel, satin, etc) I personally love using satin, it take more patience to work with but the end result is SO worth it. - Quilting Foot, again not necessary, but a quilting foot helps keep your fabric from shifting more than a regular foot. - Quilting pins (curved safety pins), regular safety pins will work too, the curved ones are just easier to use. 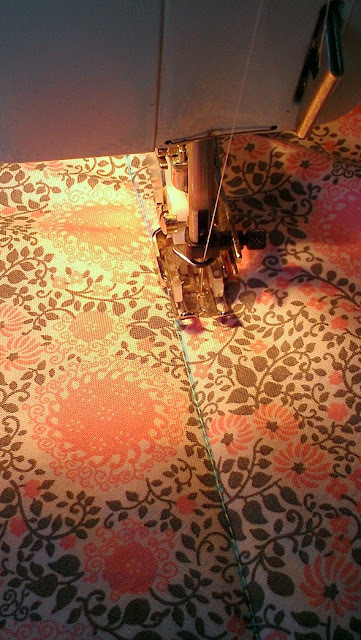 - Sewing basics: machine, matching thread, scissors (gingher are my favorite,) ruler, fabric marking pen/pencil or chalk, etc. - Flannel shrinks and because you have 3 or 4 layers of it (if you choose to use flannel) they will all shrink differently and you don’t want that happening after it is all sewn together because it could cause some weird bunching or pulling. - Flannel creates a lot of lint and after you sew the blanket and cut it up it creates even more than normal, by pre-washing it you will save some wear on your washer and dryer by splitting up the amount of lint that will come off in two loads instead of one. - Just in case the dyes in your fabric bleed, that will happen in the pre-wash instead of after and the colors won’t get all over each other. After your fabrics are all washed either remove them immediately from the dryer and start the next step of putting the blanket together so they don’t get wrinkled or iron them before you start to get all your wrinkles out. Lay out your back fabric, the fabric with a print on it, on a solid surface face down, I use my kitchen floor. Then lay your flannels down one at a time on top of the back fabric. As you lay each layer down smooth them out. I like to put my brightest/boldest color on the bottom because it will stand out the most after it is done and if it’s the top layer it might be a little too bold. 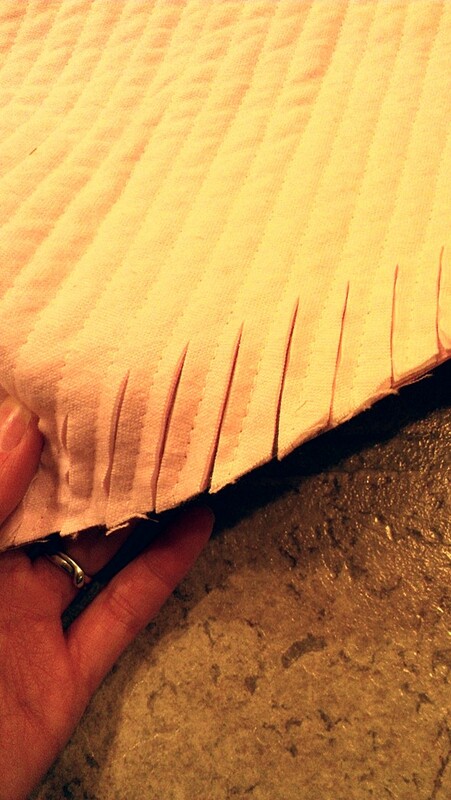 It’s okay if your fabrics aren’t squared off or if one layer is longer than another, you will fix this all at the end. Just try to center them on top of each other, like I did in the picture below. Smooth it out the best you can. I usually smooth it all out then flip the whole thing over, smooth that side, then flip it all back over again just to make sure there are no big wrinkles in it. Next you will want to pin the layers together. Pin on the side you are going to sew on. I pinned mine on the back fabric (my print) but for picture purposes I am showing you the back because the pins were impossible to see on the other side. Your pinning doesn’t have to be perfect, you will remove the pins as you go, but put enough in to help hold it together while you are moving it. I usually use about a dozen pins. It will probably get some wrinkles in it at this point and that’s ok.
Now you are going to draw your line. You only need to draw one line, you will sew right over the top of it then use the width of your sewing foot as a guide to make the rest of the lines. Use a piece of string and run it from one corner to the other diagonally. If you have someone that can hold the string straight and taught for you, great, otherwise just put some books on one end so it stays still. If you have an acrylic ruler or yardstick you will need it for this, if not a book would work, but you need a straight edge to lay down just to the side of your yarn and then draw a line with your fabric marking pen/pencil or chalk (just make sure it will wash off!). After your line is drawn, roll both sides up to the line. 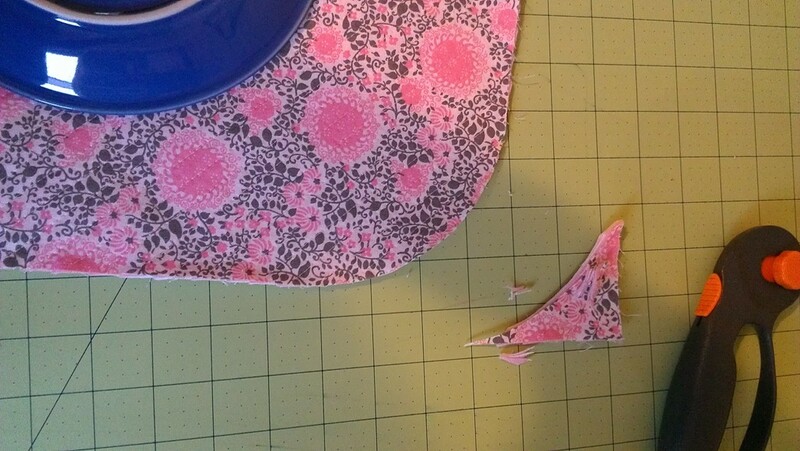 Prep your machine before you sew. Because will be sewing 4-5 layers of fabric together and the majority of those are flannel, you want to make sure and take care of your machine. I always start with a new needle and oil my machine before I start. About half way through I clean it out all the lint and oil it again, then do this again when I am finished. Here’s what mine looks like half way through. You will also want to fill 2 or 3 bobbins if you have extra ones because these take a lot of thread. By having extra bobbins already wound you will be able to just quickly change one out and keep going. It might not look like much but there is a ton of lint all over the place. 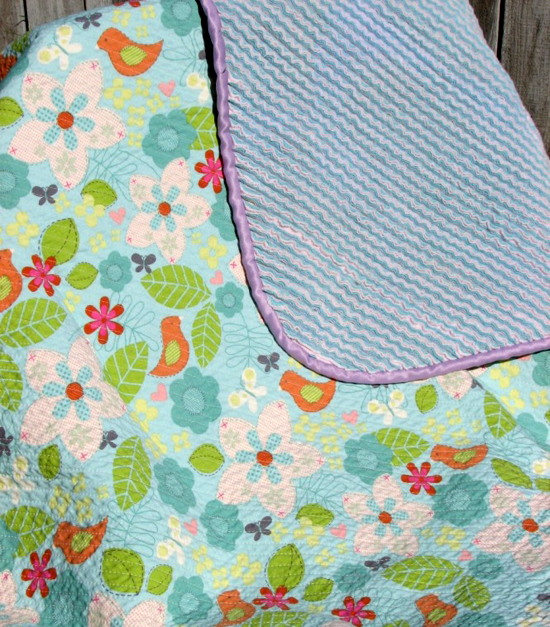 Sew your first line right over the top of the line you drew. Also, you do not need to backstitch at the beginning or ends of your lines. The next line you sew will be to the right of your first one. Position your needle all the way to the right and use the side of your sewing foot as a guide to keep your lines straight. You want your lines to be about 3/8” apart. The closer your lines are together, the better. After you wash it your fabric curls up and if the lines are sewn too far apart then there will be big gaps after it’s washed, and you don’t want that. In the picture above you can see how my foot is right next to the line I just sewed and the needle is positioned as far to the right as it will go. Now just sew, sew, sew! Once all your lines are sewn you are going to square it. You don’t square it until this point because as you will notice, the fabric shifts and stretches during the sewing process. I don’t have any pictures of how I square mine, sorry, I just wasn’t thinking. The main thing you want to pay attention to is that you cut it so that all your layers end up the same. 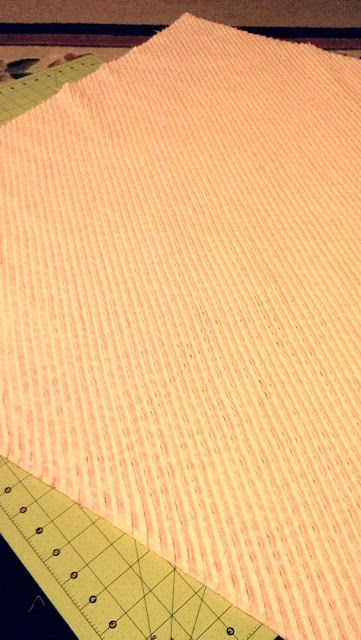 Because it shifts during sewing and to begin with your fabrics probably aren’t all the same size, your cotton fabric will probably be sticking out the most and then maybe layer 1 of flannel but then maybe layer 2 is shorter than layer 3 so you want to cut it so that all the layers are even. I hope that makes sense, sorry about not having pictures to help explain it better. It always amazes me that after sewing 100+ lines they don’t stand out more! Now comes the other fun part, cutting! Again, don’t be scared, but this can take a really long time. I recommend a Faux Chenille Cutter, it will save your life. 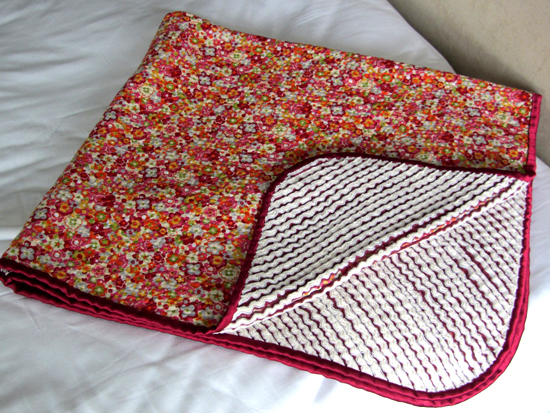 I made two blankets before I got a faux chenille cutter and they took me about 3-4 hours to cut, now, they take me about 45 minutes with the cutter. Seriously, they are a-ma-zing! If you are using scissors, just start cutting. Start at one end and move to the next. Make sure you do not cut through the back layer! Only cut through the 3 or 4 layers of flannel. At the beginning of each row take an extra second to make sure you don’t cut through your back layer, this extra second might save you a lot of heartache. 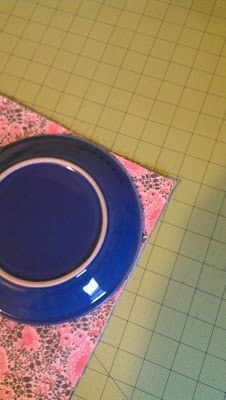 If you are using a chenille cutter, I recommend making a snip or two with your scissors to start each line. The reason being, after you square off your blanket your strings are left loose (there’s no backstitching to hold them in place) so if you go right at it with the chenille cutter it can pull some of your threads undone and you don’t want that. Once you are done with the cutting you are SO close to being done! This next step is personal preference. But I like to round my corners. If you prefer squared corners, that’s great and just leave it how it is. I like the rounded corners because I feel like it just makes the blankets look “softer” and since they are for babies, I like the “soft” look. If you want to round your corners, get a plate and use that as your guide. 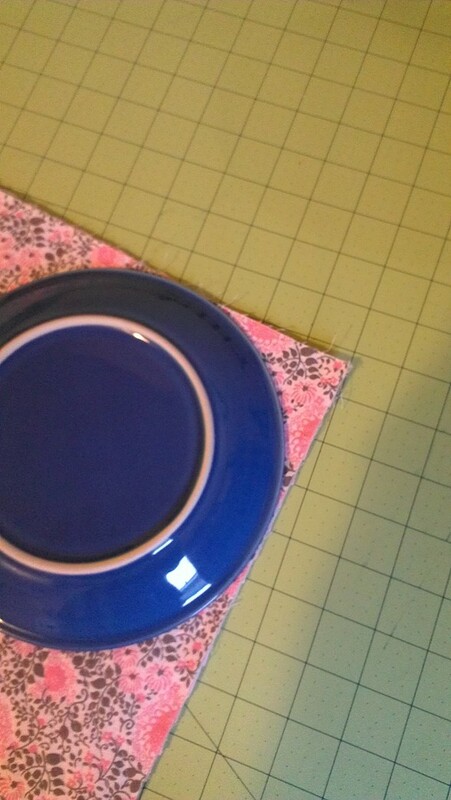 Set it where you want your corners to be and use your rotary cutter to cut it, or trace the plate and use scissors. I know there are tons more out there, I’m sure you can find one (or even a video) that helps you the most. 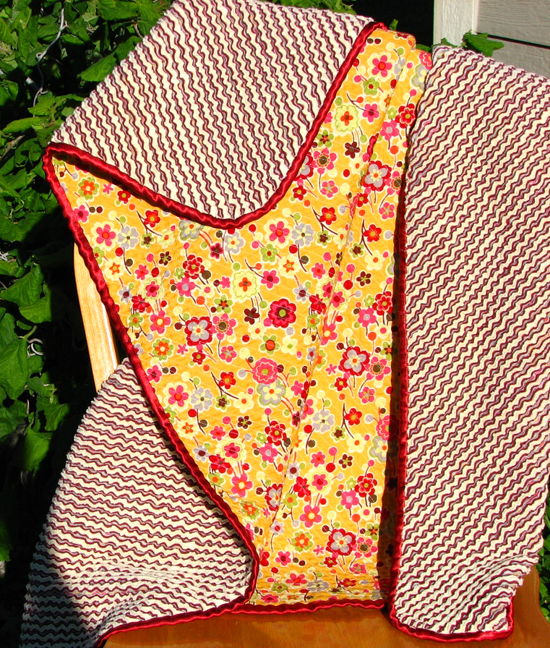 You want to attach your binding to the flannel side, or cut side, with your machine. This is important if you are going to hand bind the other side, I accidentally sewed it to the cotton side first and hand stitching it to the cut side was frustrating to say the least. 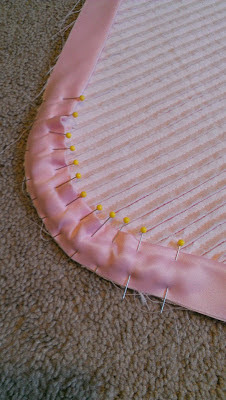 If you rounded your corners use LOTS of needles to hold it in place before you sew. Depending on who you talk to, some will say sewing over needles is fine, others say it’s the worst thing you can do. I have made seven of these and every time I sew over all my pins and have never once broken a needle. 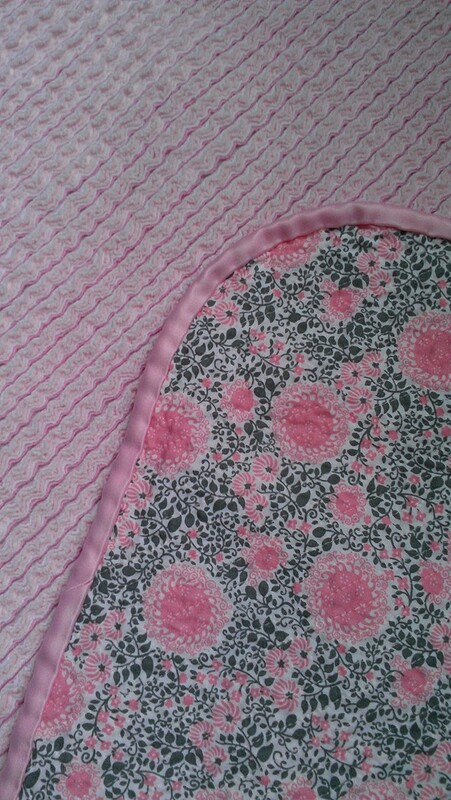 Again, I recommend hand sewing the binding because in my opinion it looks so much better, but do whatever works for you. If you want to see some examples of other color schemes, here are my other ones. These blankets are perfect for babies, or even for yourself to cuddle with while watching your favorite movie. WOW! These are so beautiful. 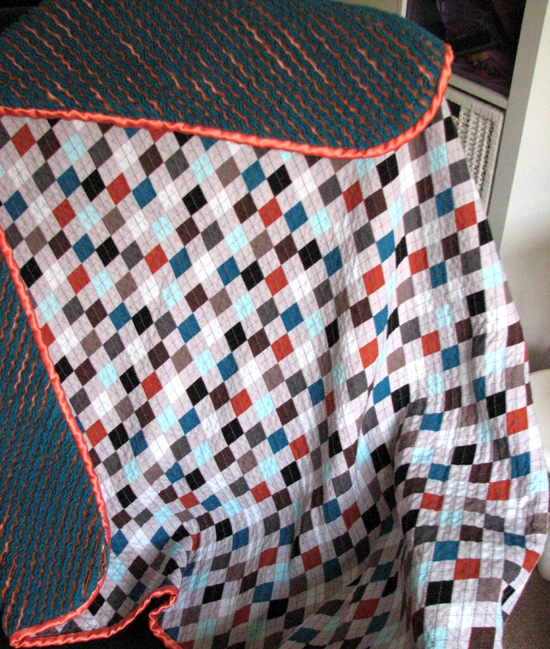 I've used chenille on the bottom sections of my jacket sleeves, but I've never seen a blanket made. I can't wait to make one! No wait, 2, 3, 4... Thank you so much for sharing. Thanks for sharing this tutorial... really you did great job..! These blankets are beautiful! Thank you for the well-done tutorial that explains the process so well. I don't understand why you cut the edges . . . and you don't say how long a cut to make. 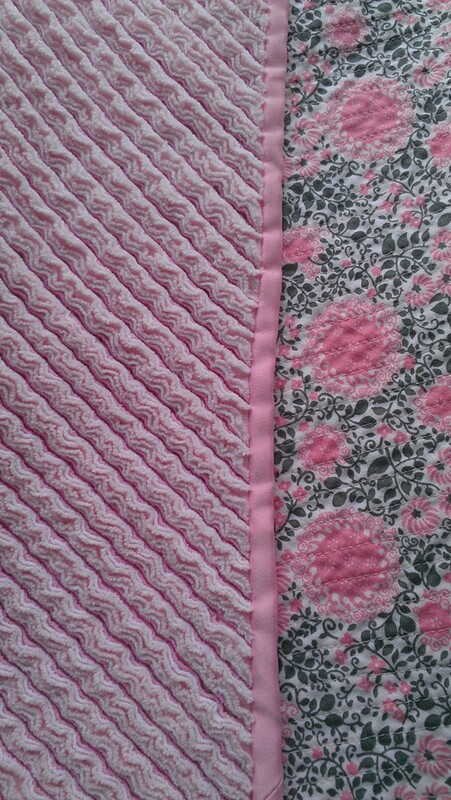 In the process of making one right now with pinks, greys and whites. So excited to see it finished. I've been checking blogs to see if there is any other insight of things I may have missed. Thanks for putting in your tidbit about binding because I probably would've sewn it to the front out of habit.